The Safari browser on your iPhone SE has a version of tabbed browsing that lets you have multiple Web pages open at once. If you regularly use a Web browser on a desktop or laptop computer, then you are probably familiar with tabs and how they work. 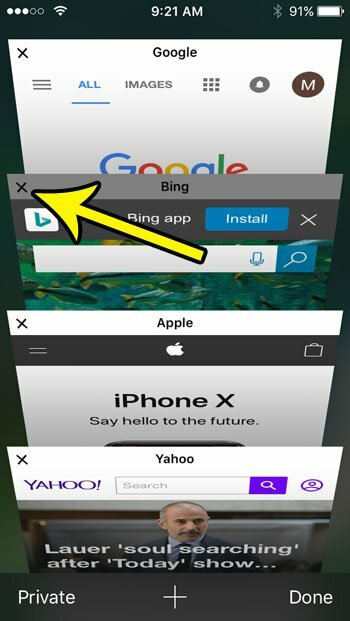 But unlike the desktop or laptop browsers, the iPhone SE tabs in Safari are found by opening a separate “Tabs” view within the browser. There you can find all of the tabs that are currently open on your device. If you have never gone into the Tabs window, and you browse the Internet regularly on your phone, then there might be a lot of open tabs there. Fortunately you can close Safari tabs on your iPhone SE by completing the steps below. The steps in this article were performed on an iPhone SE in iOS 10.3.2. These steps will also work for other iPhone models, as well as many other versions of iOS. Note that closing a tab does not remove it from your history. If you don’t want a Web page to appear in your browsing history, then you need to use a private window, or you need to clear your browsing data. Step 2: Touch the Tabs icon at the bottom-right corner of the screen. It’s the one that looks like two overlapping squares. If you don’t see the menu, swipe down on the screen. Step 3: Tap the x at the top-left corner of the tab that you want to close. Note that you can also swipe a tab to the left side of the screen to close it. Is your iPhone out of storage space? Learn how to free up iPhone SE storage if you want to install an app or an iOS update, but your phone is telling you that you don’t have enough room.